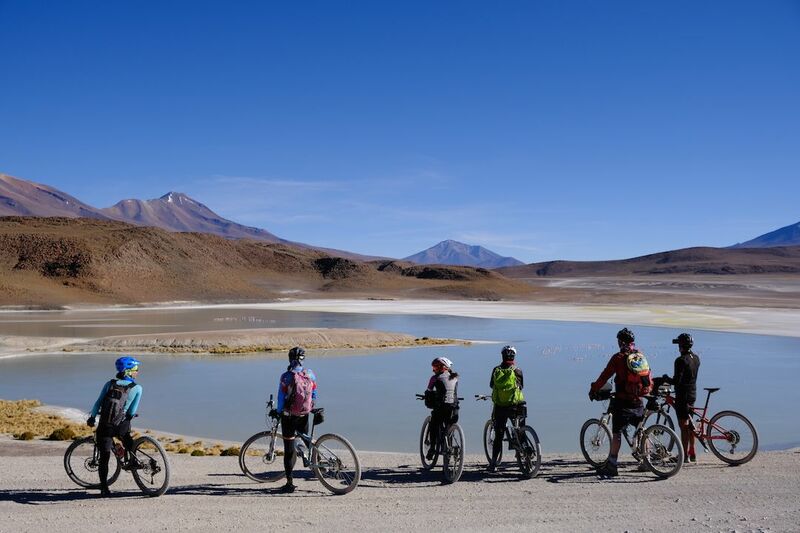 In this course, unique landscapes, which may seem like “another planet” for the originality and sensations that awaken … Also the effort may feel from another planet … The tour takes place at an altitude ranging from 3,700 meters to find 5000 m / m, on a surface that is sometimes very hard to pedal. 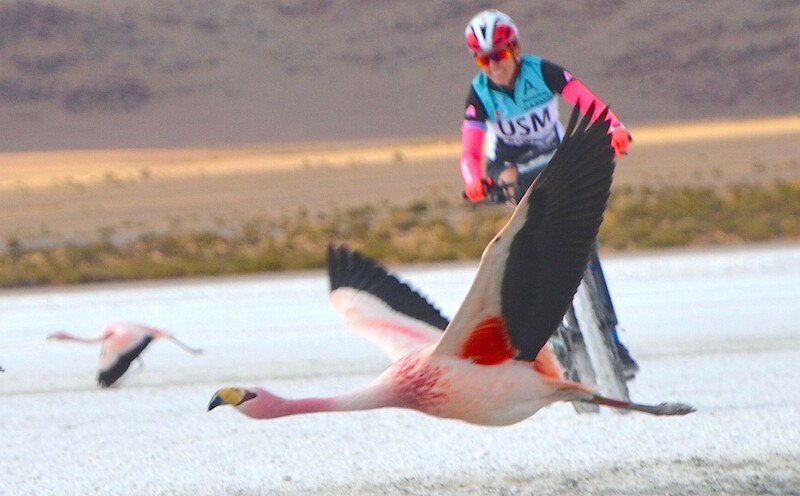 To achieve this route is important to adjust to “the pace of the plateau”, pedaling with the calm required for this circumstance and if necessary get off the bike and walk along with it. 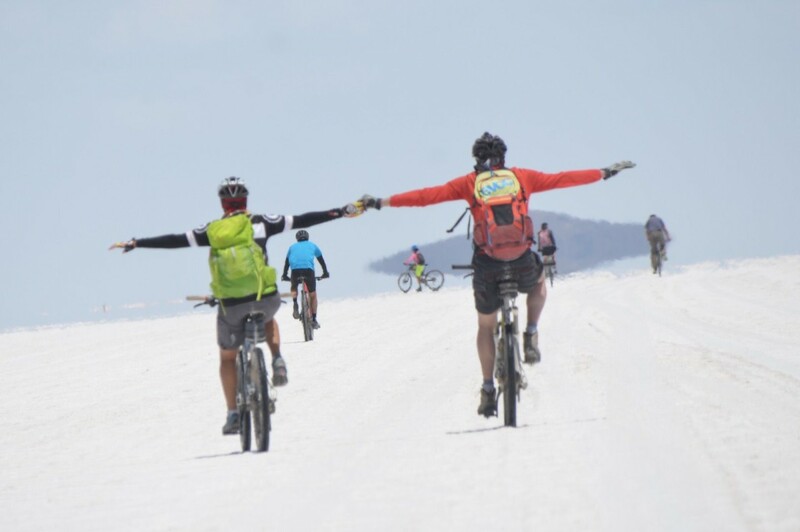 Finally, the effort will be worth and cyclists capable of doing so will have the opportunity to live a unique experience. 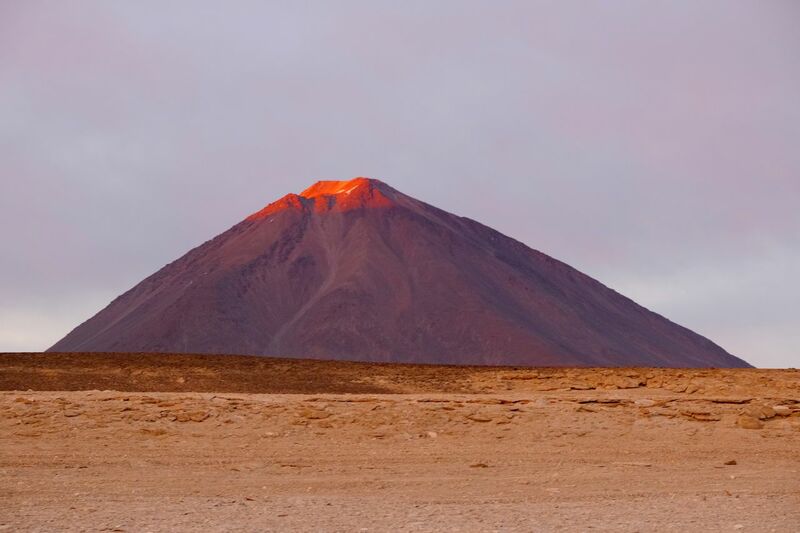 New: This year we will climb to 3 volcanoes! 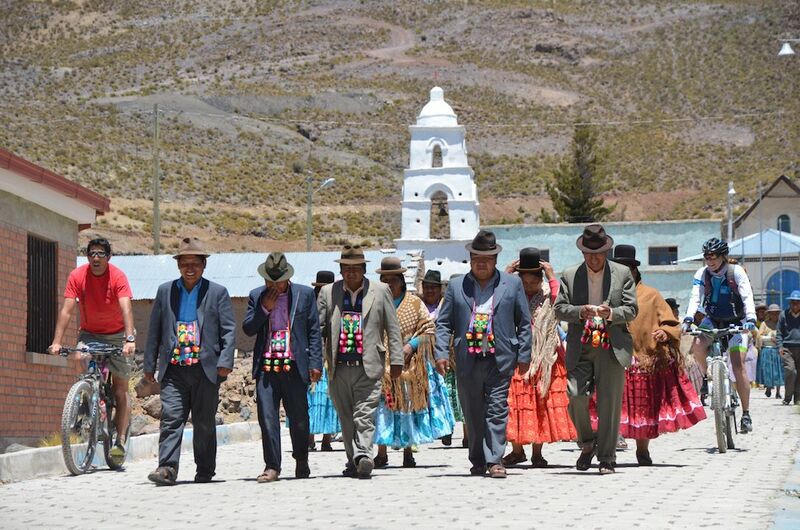 Meeting in city of La Paz (3.500 m). Presentation dinner. 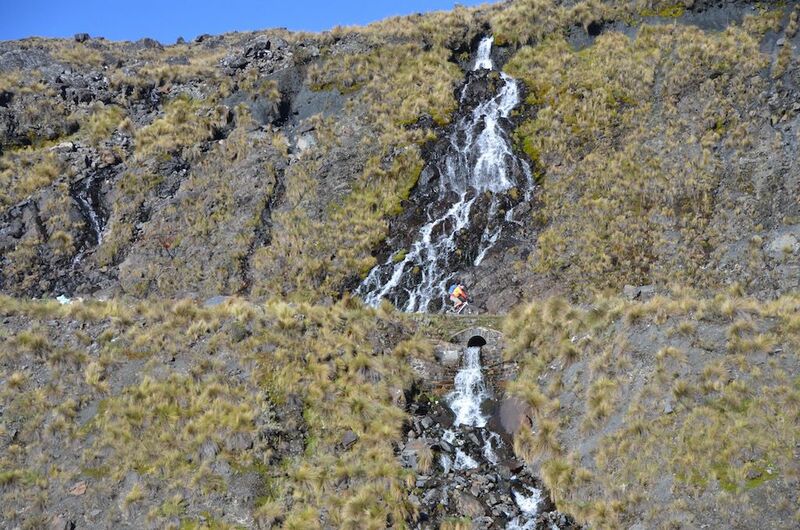 One of the “Downhill” steepest in the world, from 4,700 meters to 1,200 meters above sea level and only 64 km. From the high peaks of the Andes, it descends, with sharp cliffs and waterfalls, to the tropical vegetation of the “pre Amazonia”. 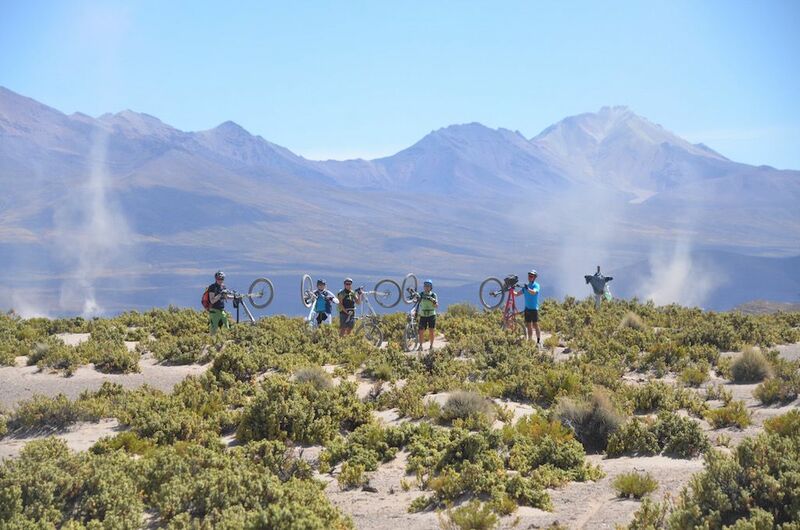 Technically not difficult but attention and coordination on the mountain bike is required. We’ll have a lot of excitement and adrenaline for the first day of the trip! Note: This road was considered one the most dangerous in the world for motor vehicles, but since recently, a new paved road was open, through which most cars are diverted. 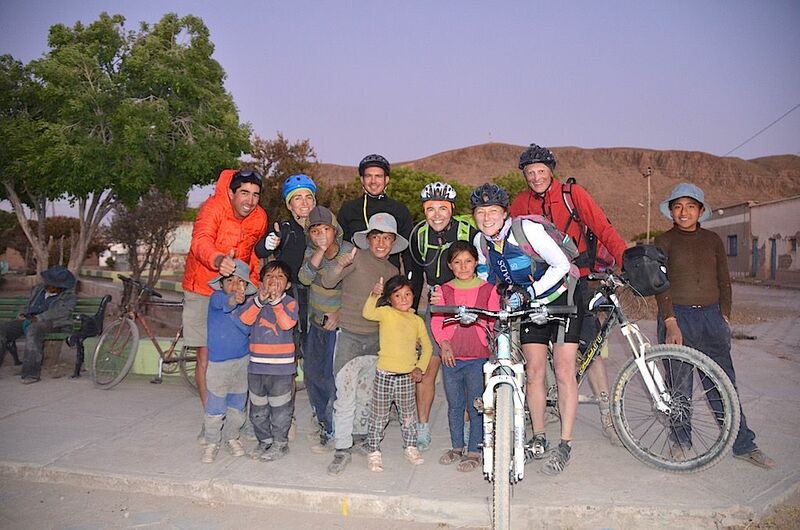 Overnight: in the same hotel as the previous day in La Paz. Transfer (4 hours). 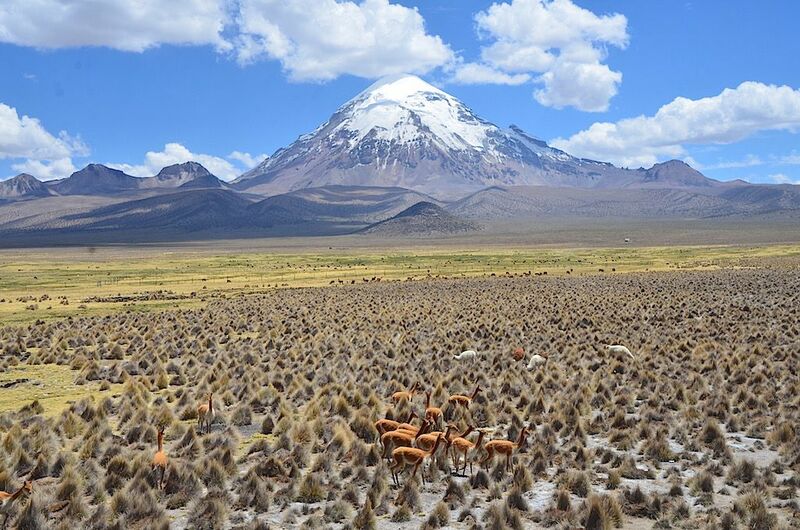 Sajama National Park where the Nevado Sajama is located, a spectacular volcano and the highest peak in the country (6542 meters above sea level). 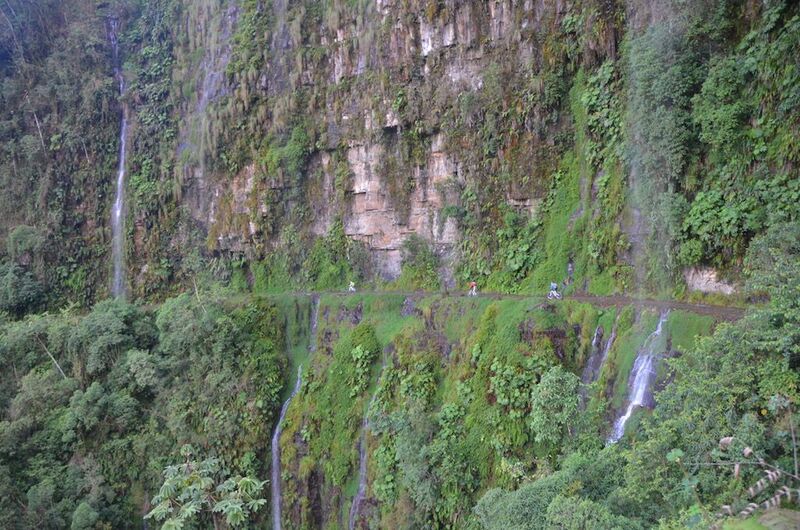 the attraction of this place are the scrubby forests of queñua, growing up 5000 masl, geysers, lakes and hot springs. 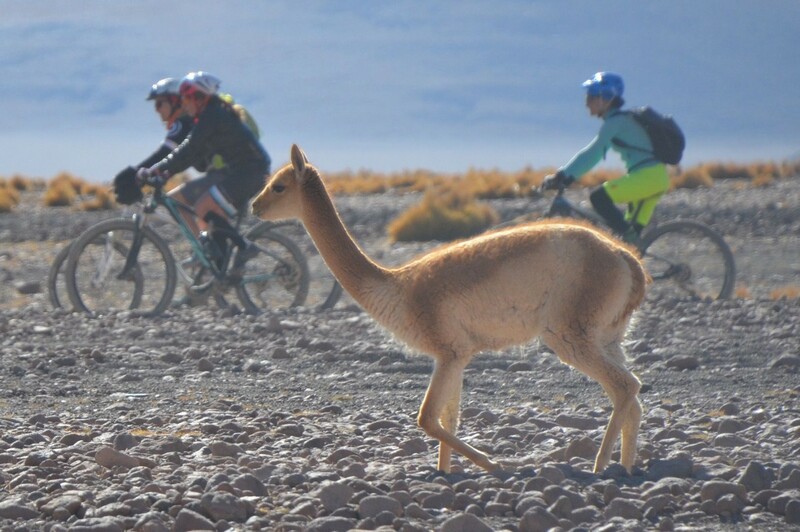 Pedaling: 4km of acclimation, 20 or 30 km walk or very slow in the area. 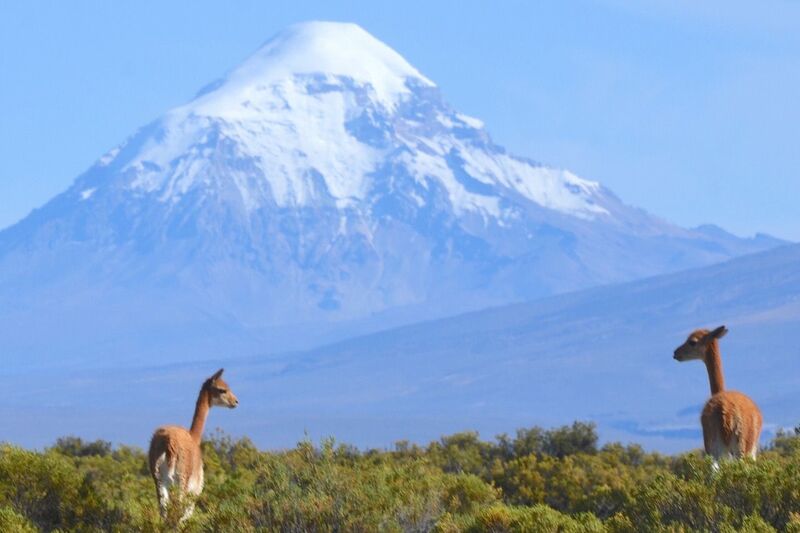 This stage will begin with the sight of the twin volcanoes Parinacota and Pomerape and others such as Umurata, Gualatiri, found on the Chilean border, near which we will always ride south. 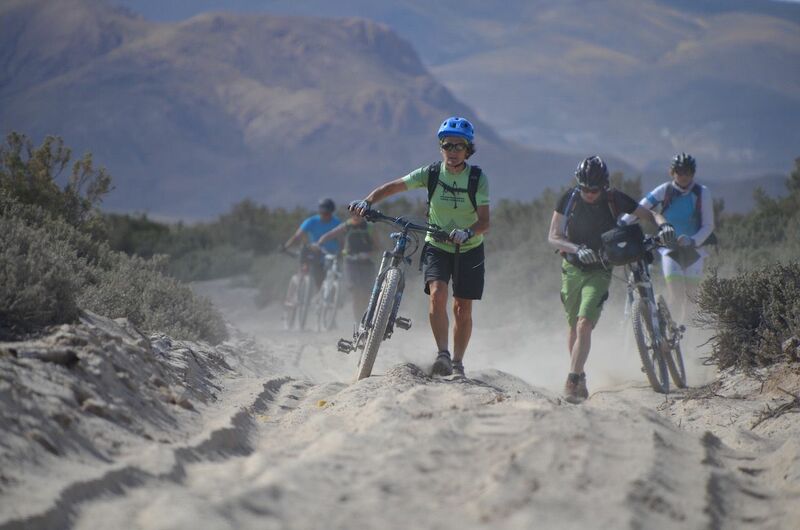 For this stage we will go through small towns with fewer ups than downs, with some sandy sections. We will have opportunity to see “chulpas” testimony of ancient indigenous culture. 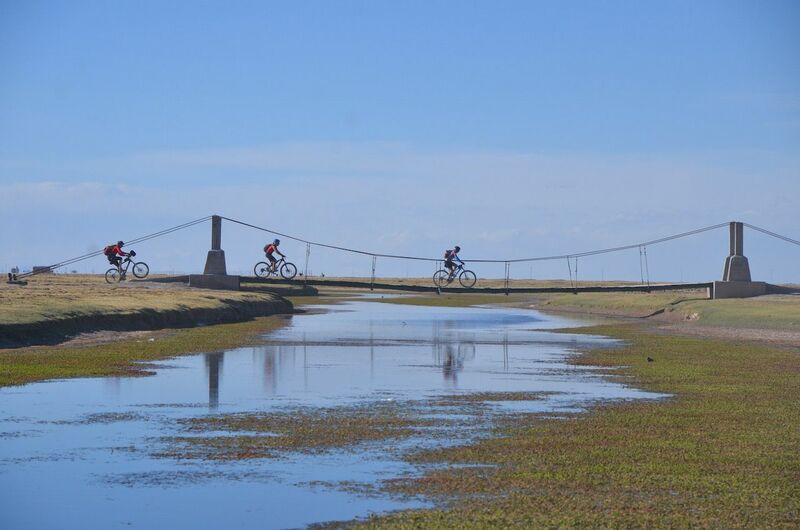 It may be a quiet stage, with some river crossings and short stretches of sand, appreciating the life of the humble people of the highlands. 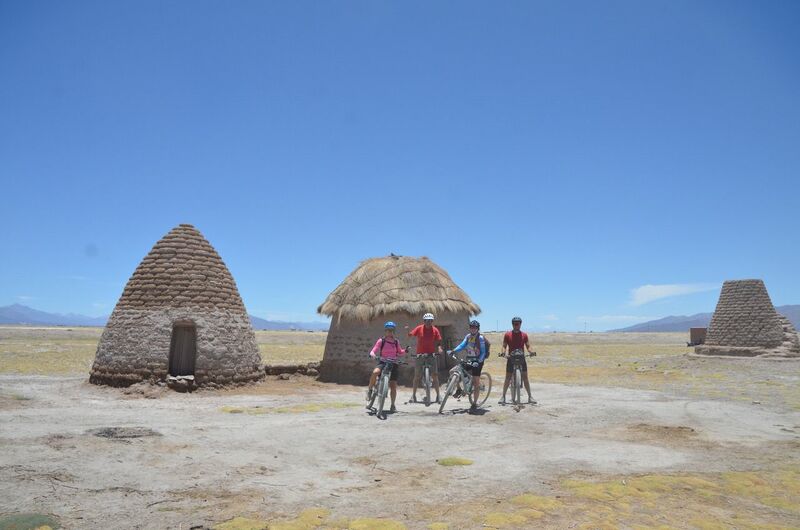 At this stage we will have one of the highlights of the trip: we will meet the “Chipayas” which are the oldest indigenous people of the highlands (around 2500 BC) they inhabit some curious houses called “putucus”. 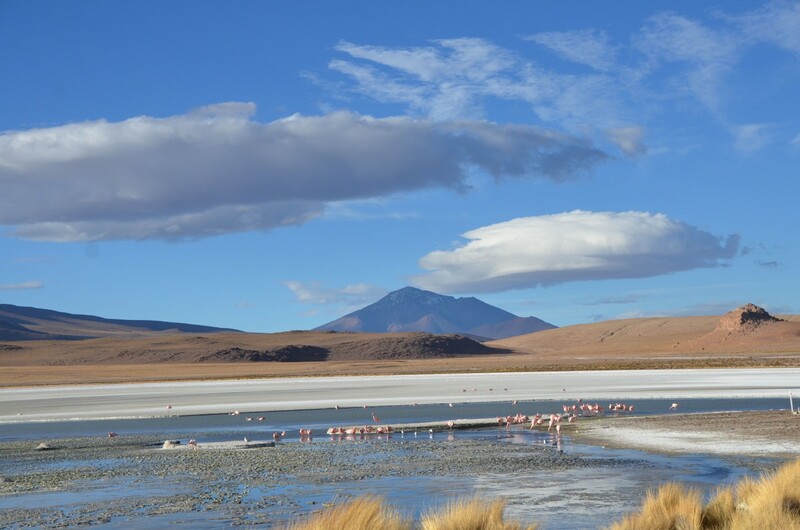 They live near the periphery of the “Salar de Coipasa”. 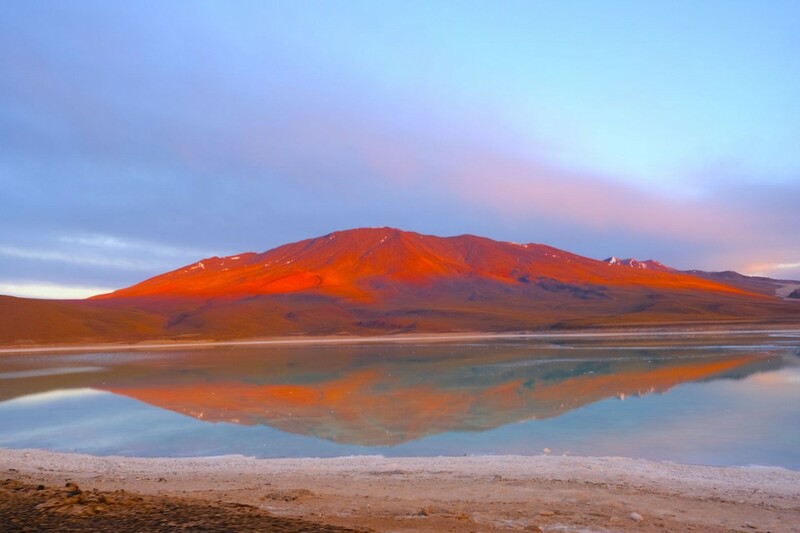 We will pass through small villages, the salt mine of Garci Mendoza and the homonymous village. 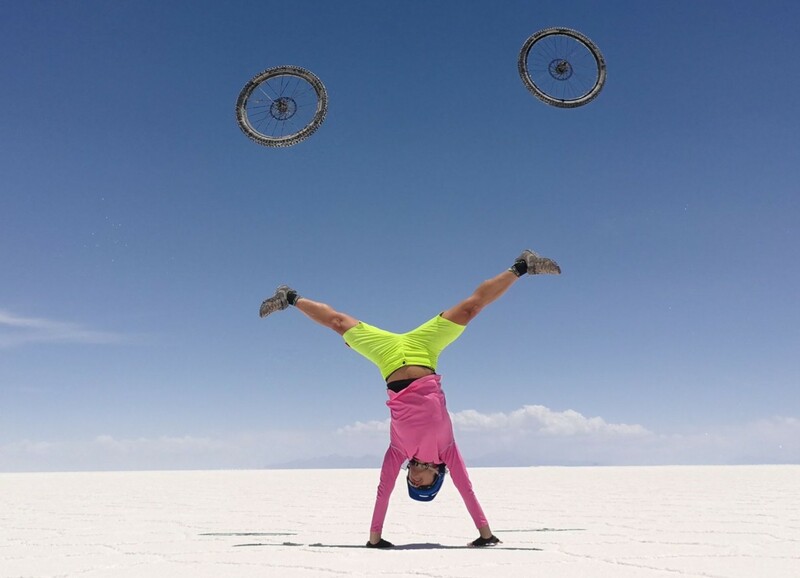 We will skirt the Tunupa volcano to reach, we will admire the spectacular view of the Salar de Uyuni. 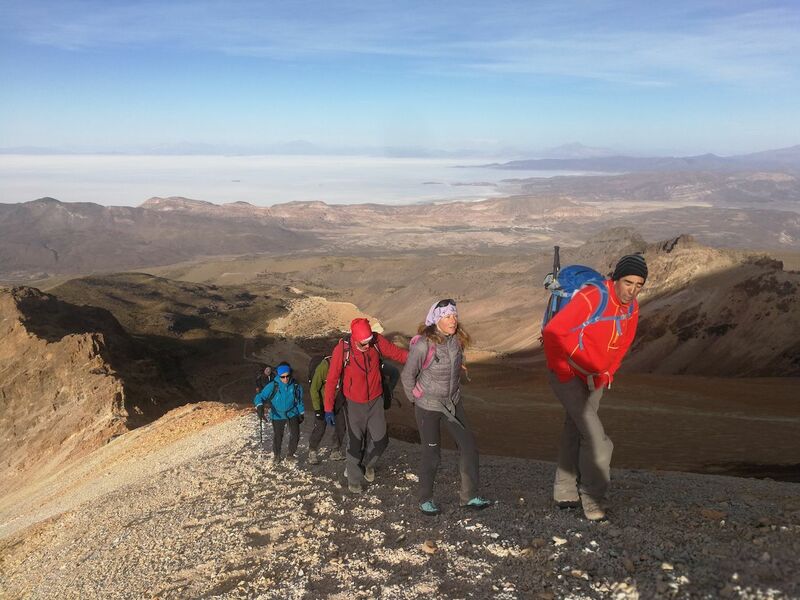 After a short transfer, we will begin a trek to reach the summit of the Tunupa volcano (5320m), with a spectacular view. 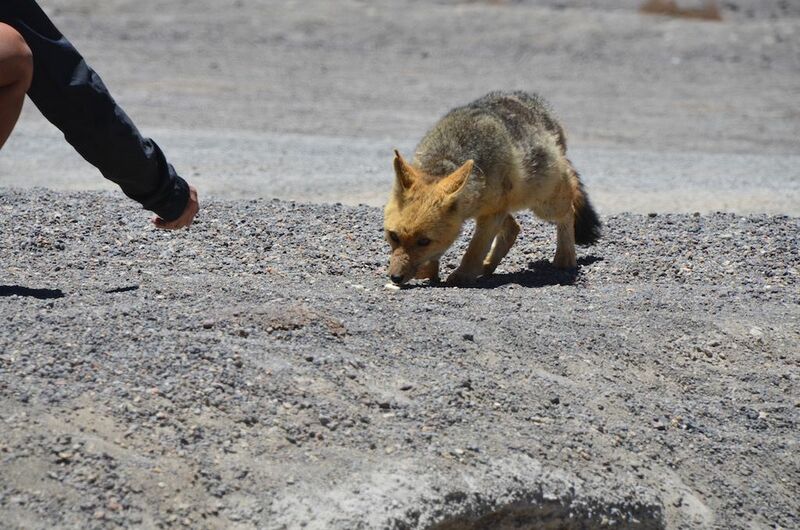 In the early afternoon, we will cross the Salar de Uyuni, stopping (km45) on the Inca Huasi island. 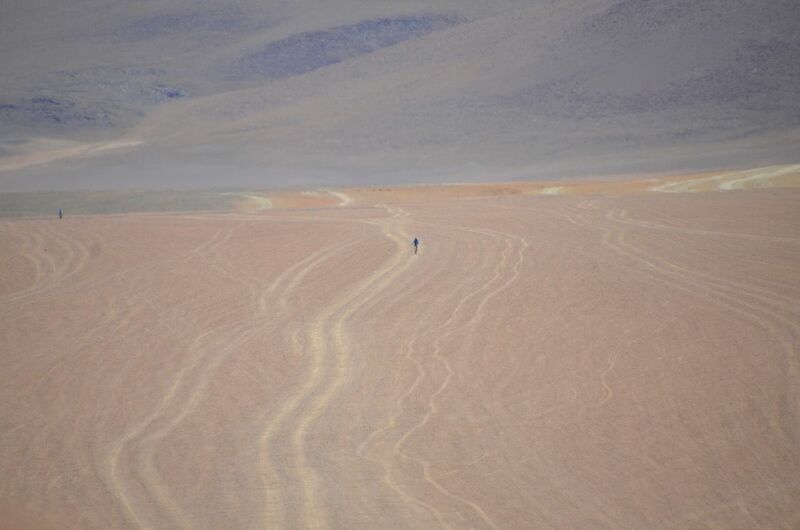 We will finish the stage on the outskirts of the Salar. Trekking: about 3 hours. 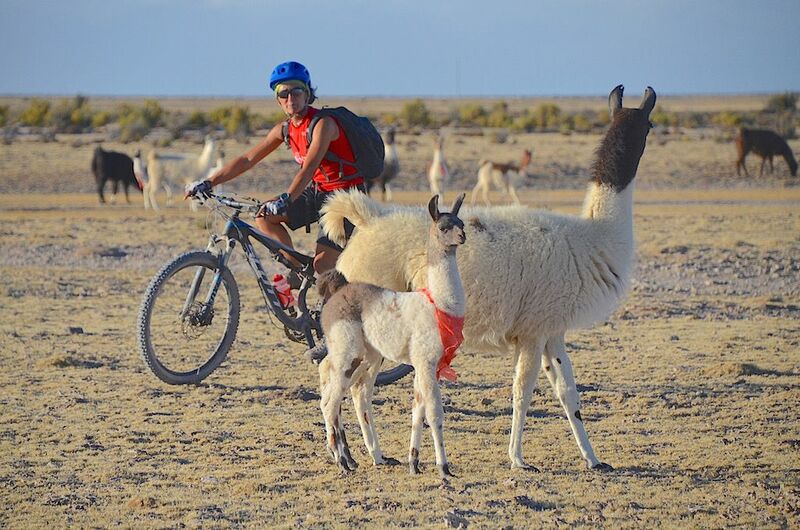 We will ride a valley full of small villages. A quiet day to recover strength. 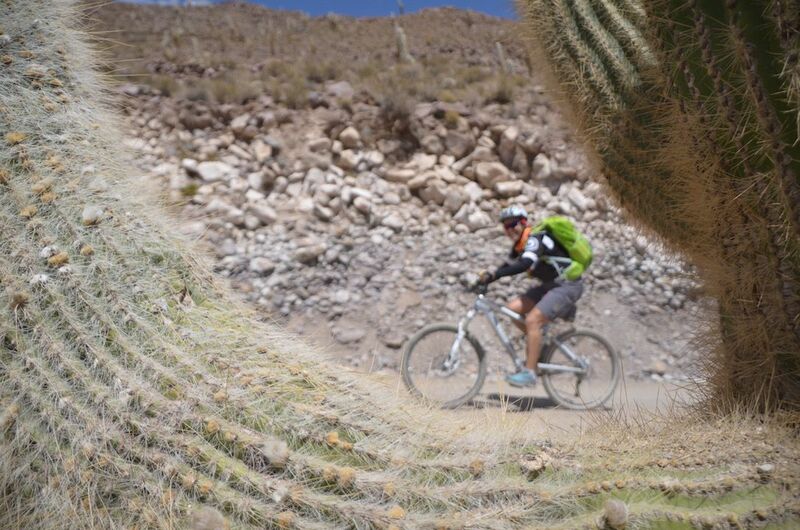 We will cross a predominantly agricultural valley, where quinoa is cultivated and small farms are found. 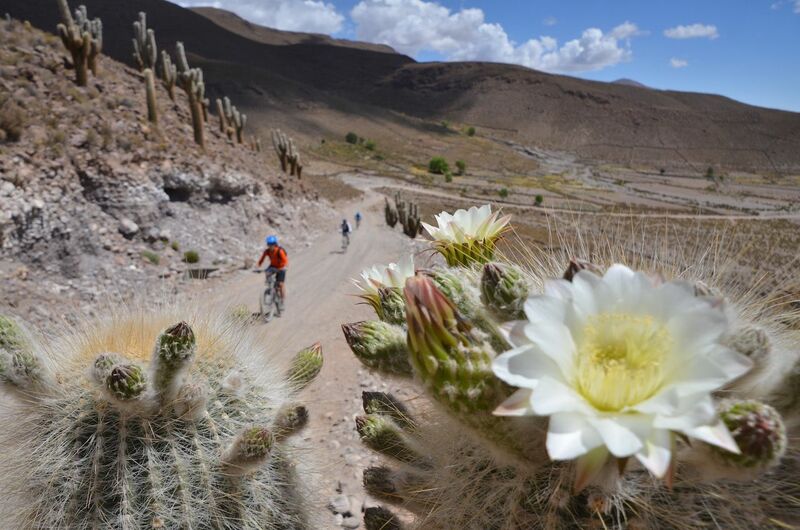 At 60km the Salar de Chiguana will start, just before the village of Ollague, we will have to pass the Bolivian customs and enter Chile. 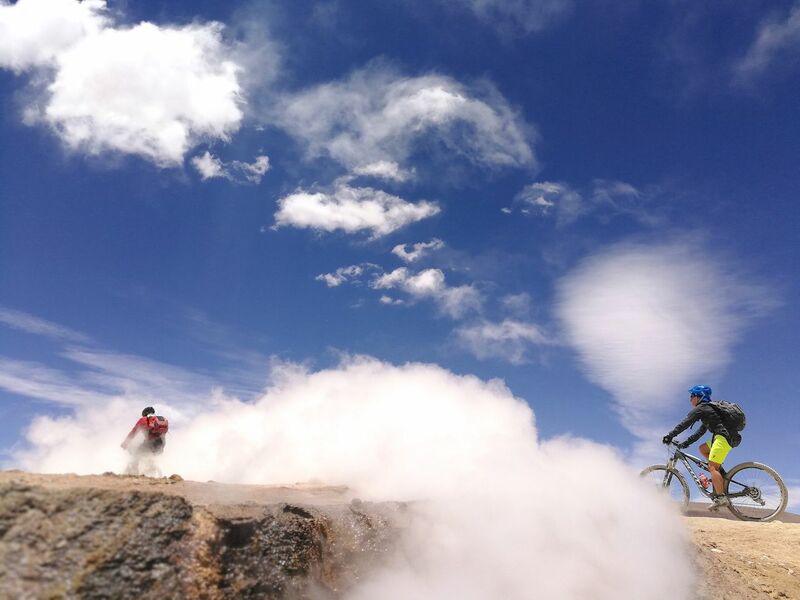 After a ride, we will take a trek to get to the crater where the smoke comes out and we will appreciate a breathtaking landscape. 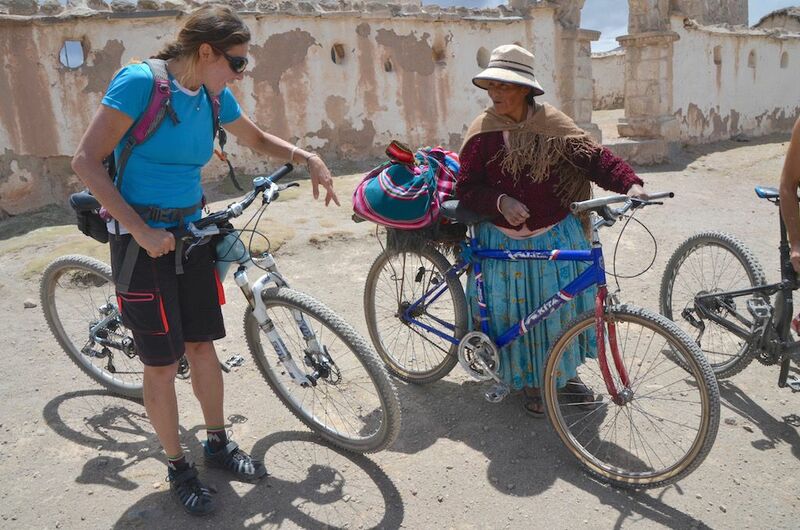 Cycling: 20 km uphill, up to 5200masl. 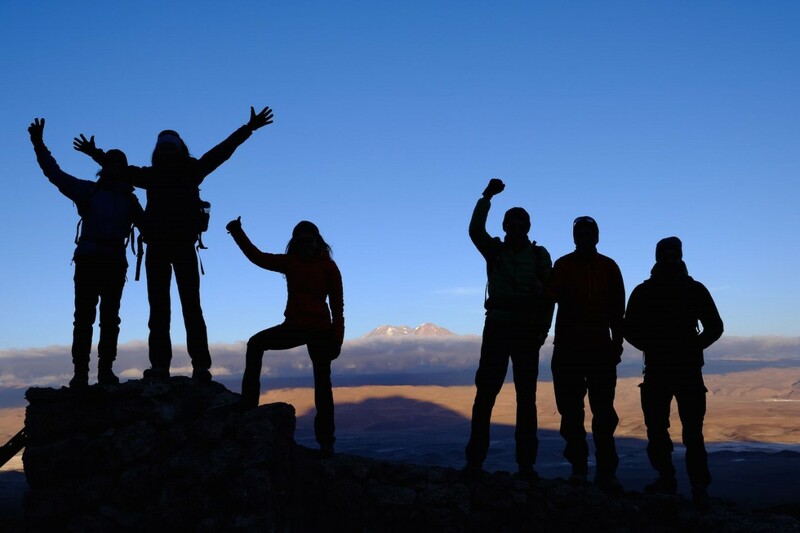 (possibility to go up by 4×4).Trekking: 5 km. 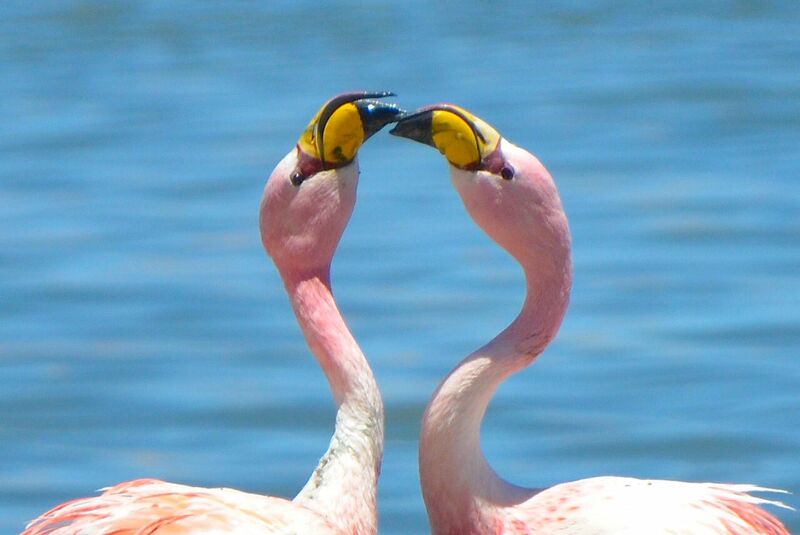 We will return to Bolivia and we will go to the Chañapa and Hedionda lagoons, where there are many flamingos. We will cross the “Siloli Desert”, characteristic for its rocky conformations created by the wind, the stone tree is among these the most significant. 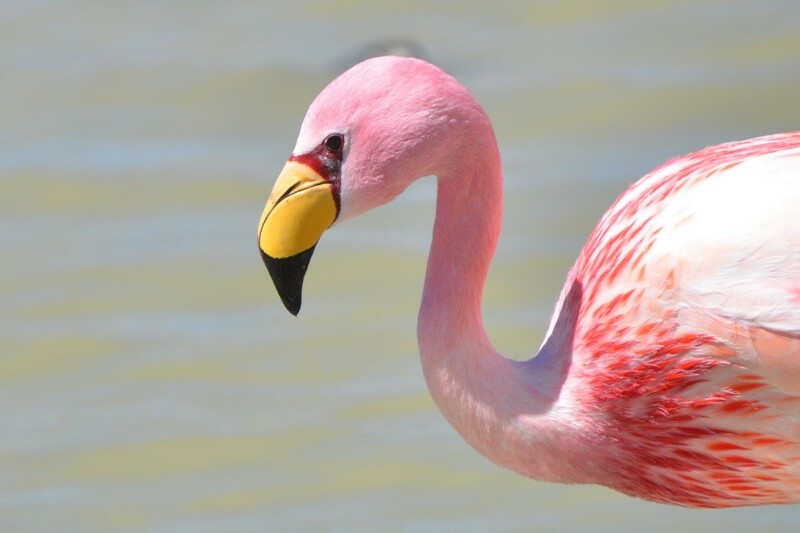 Towards the end of the stage inside the Eduardo Abaroa Nature Reserve, we will reach the splendid “Colorada lagoon” animated by thousands of pink flamingos and colored with intense red due to the presence of algae. 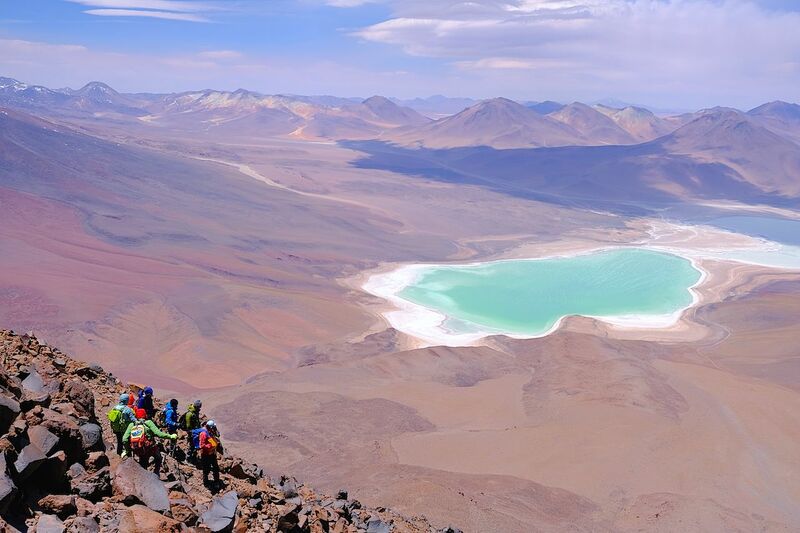 After a transfer, we will begin to walk, before dawn, until we reach the volcanic cone with a small lagoon and a beautiful landscape, with the green and white lagoon. 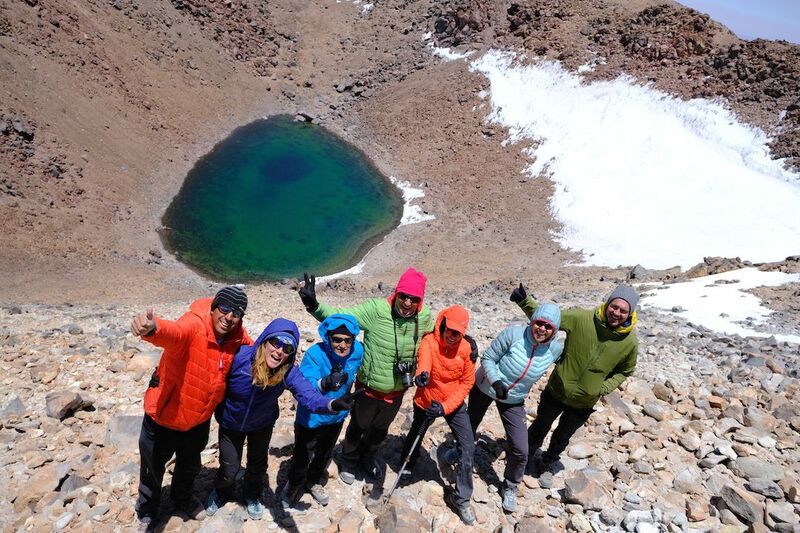 About 7 hours of trekking and 1100 meters of difference in height. 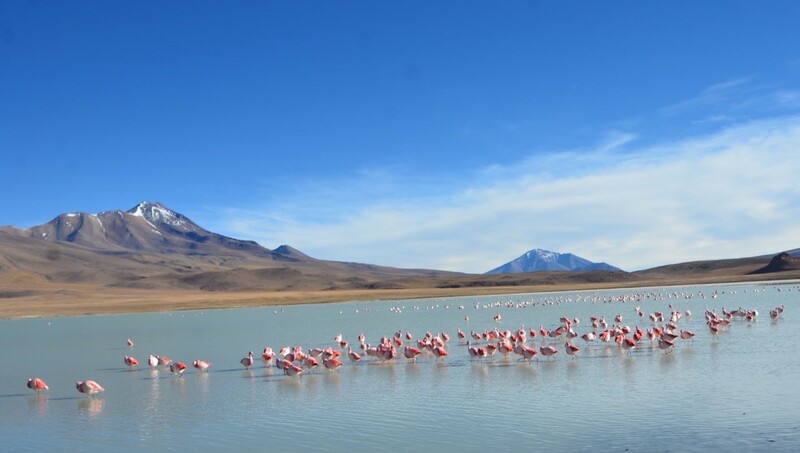 I return to our Polque refuge, to still enjoy the open-air baths with a breathtaking view. 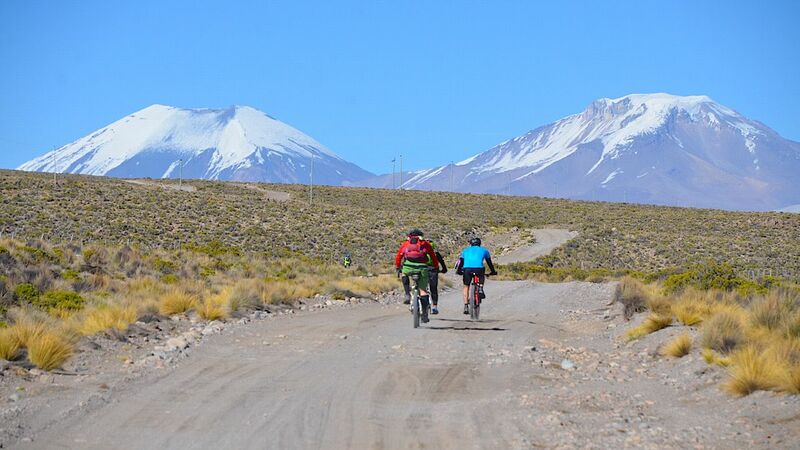 Pedaling to the border with Chile (km 8) with beautiful views of the volcano Juriques we will reach the Bolivian customs and enter Chilean land. 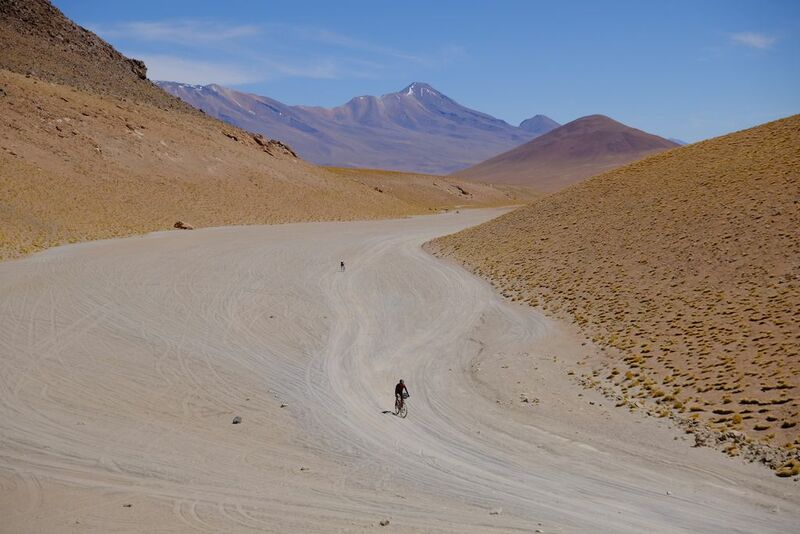 A handful of kilometers of dirt road to reach the asphalt and the long and fast descent (40 km) will launch us towards S. Pedro de Atacama. Farewell dinner. 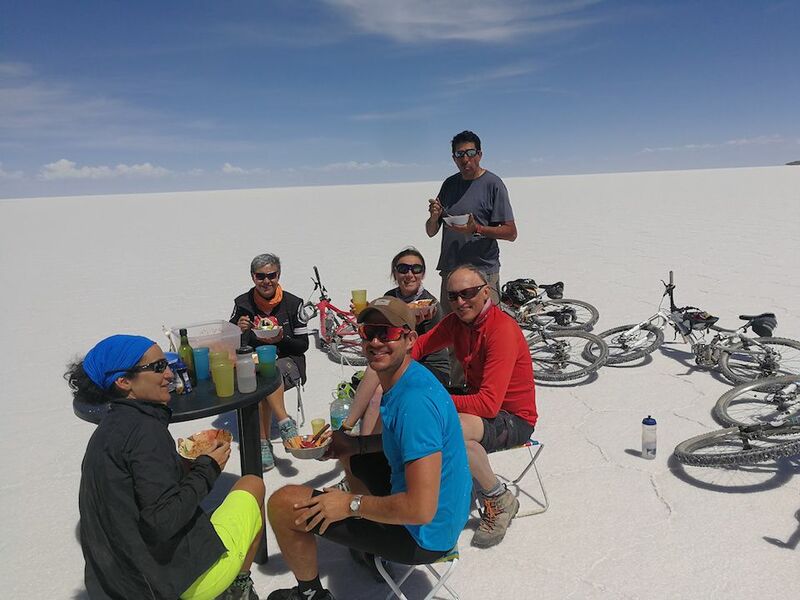 Day 17 – breakfast and greetings. La Paz, yungas, Sajama National Park, Volcan Sajama and surrounding volcanoes (Pomerape, Parinacota, Umurata, Gualatiri), countless villages of the Altiplano, Salar de Coipasa village Chipaya, Garci Mendoza, Volcan Tunupa, Salar de Uyuni, Isla Inca Huasi, Villa Martin, San Juan, Salar de Chiguana, Volcan Ollague, volcano Tomasami, Laguna Cañarapa, Laguna Hedionda, Desert Silioli, Laguna Colorada, National Andean Fauna Reserve Eduardo Abaroa, Laguna Verde, Laguna Blanca, Volcan Licancabur Volcan Juriques, San Pedro de Atacama (Chile), Valle de la Luna. 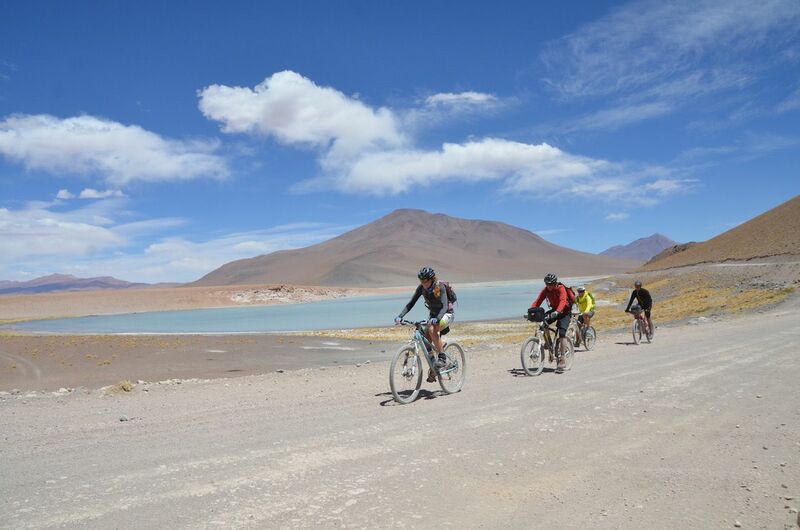 This is a journey where participants can take advantage of the service and choose to ride along the entire route, hike in the high mountains or even use support vehicles and rest when they need it. Puede oscilar entre -5°C y 25°C. 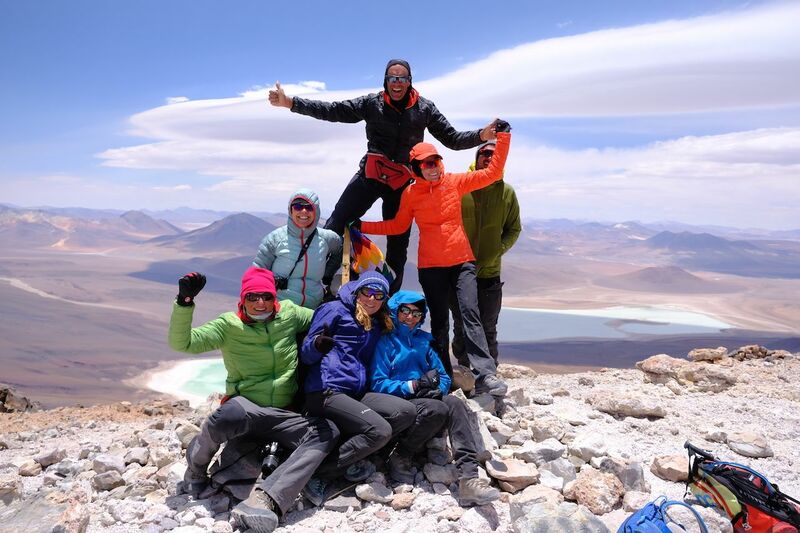 accommodations and meals mentioned in the program All transfers from La Paz. 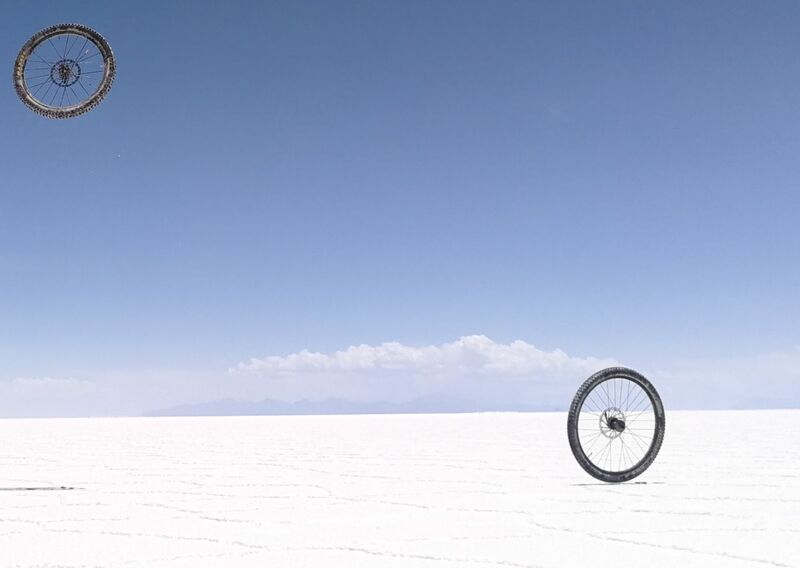 Semi-slick mountain bike covered with prior mechanical check. Canteens or backpack to carry water (Camelbag). Rain coat or waterproof jacket.